I have a name suggested for the girl whose name was a query on the list above. 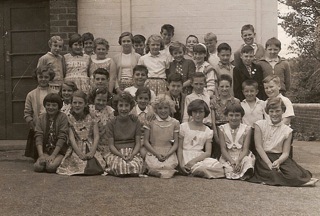 She is the girl with the V shaped white trim on her dress and she is sitting next to Brenda Hutchings. It has been suggested that her name was Lynn Brookes. Can anyone confirm or dispute this? Kneeling/Sitting: Joan Barker, Glenda Gascoigne, Wendy Hillaby, Sandra Hurst, John Bickers, Pat Taylor, June Allen, Peter Collins, Linda Sewell, Carol Smith, Brian Smith, Colin Hitchins, Pat Hemstock, Arnold Chapman, ????? Evan Davis, James Whitely, Brenda Hutchings UNLESS YOU KNOW BETTER AND CAN CORRECT US. ALSO WHO IS THE UNKNOWN GIRL?